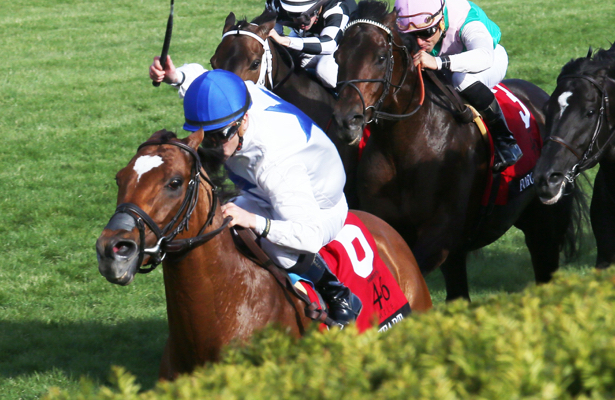 Ontario-bred fan favorite Heart to Heart has run his last race, trainer Brian Lynch said Monday after the 8-year-old finished last of seven in the recent Maker's 46 Mile (G1) -- an event he won a season ago -- at Keeneland. By English Channel, Heart to Heart assumed his regular front-running position in the Maker's 46 Mile before folding in the stretch over grass rated "good." “I was a bit disappointed that he got a bit of a soft turf track the other day, because sometimes, he’ll be on a surface he doesn’t like, and he’ll say, ‘I don’t want to play today,’" Lynch said, "and I think that was the case the other day." Heart to Heart raced three times in 2019, hitting the board once with a third-place finish in the Tropical Turf Stakes (G3) in January. Overall, the horse named after the unique marking on his head finished as a $2 million earner and winner of 15 of 41 starts. The journeyman horse, who ran on 13 tracks throughout his career, will now settle down “temporarily” at Hidden Brook Farm in Paris, Ky., as Lynch and owner Terry Hamilton “weigh out our options and see what responses we get" as far as a stud career. “We’ve had quite a few people that have already reached out and showed interest, but we’re just going to see what will be the best deal for him," Lynch said. A yearling that sold to Hamilton for a bargain $25,348 in 2011, Heart to Heart retired sound, Lynch said.